I'm glad i'm reviewing this film now ,having just finished our Hyper Japan 2013 article ,it's fitting that I should review a film that's directed by one Japan's top cult directors and stars Japan's hottest martial arts property of the moment. . Yes here we have Karate Girl Rina Takeda and Noburo Iguchi ( Machine Girl ,Robo Geisha) coming together to make what can only be described as a food fight. Keiko ( Rina) is the daughter of a Sushi chef ,her father try hard to teach her the art of being a top sushi chef ,training her in martial arts which he believes is the essence to being a top Sushi master . But with Her fathers disappointment of not having a son ,Keiko decides to run away. Keiko gets a job as a Hostess waitress at a Inn renowned for their Sushi. Run by a Husband and Wife team Keiko soon finds that she is the buffoon of the Inn ,getting picked on by the other waitresses . When a party of guests arrive at the Inn from a Pharmaceuticals Group Keiko gets into more trouble. The Boss of the group is intent on being indulged ,but when a Vagrant ,who just happens to be a discredited Ex-Lab Tach from the same company decides it's time for revenge ,he injects a serum the company was working on to bring life to the dead into a big squid who sets about infecting the Sushi delicacies . Yes folks it's Zombie Sushi time , as flying sushi attacks the guests and staff turning each one intoa sushi spewing zombie. It will be up to Keiko to use her training to protect herself and her new found friend in the Janitor who was the Inn's Sushi chef but accidentally killed his wife and no longer can touch a knife. This film works more on the comic element then just the gore factor found in many of Noburo Iguchi's films . Noburo Iguchi's also uses Rina Takeda's ability as a martial artist to good effect ,more so then Seiji Chiba did in Ninja Girl. There are some great funny scenes with Keiko fending of the Pharmaceuticals company group who she has offended ,though it may be the other way. There's some good camera work as Keiko fights her way through the group whilst holding onto one guy through his underwear. The film gets even more wacky when the discredited lab tech turns into a giant Tuna with a big axe ,and chases down the group and Keiko. Now with all these films the effects are more hands on ,little CGI is used and it's more prosthetic work with fake heads and bodies filled with various fluids resembling body content. In fact in some scenes the actors and actresses have to do some quite disgusting things for effects . Don't talk to me about the Egg Yolk scene. Talk about Gag. 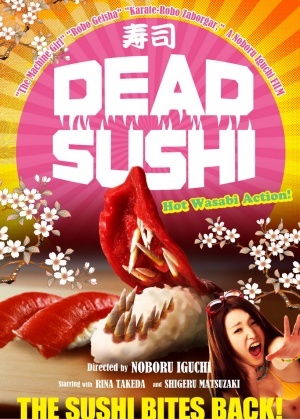 Dead Sushi is fun filled 90 minutes for those not repulsed by body fluids and a smattering of comical gore. The whole Sushi theme is quite clever with it being Japan's most famous food ,and that Noburo was inspired by Piranha 3D which did very well in Japan. Fishy it may be but Dead Sushi is a great work by Noburo Iguchi who proves himself imaginative and not put of by being to outrageous. Rina Takeda does a great job of pulling of the stunts and action as well as portraying the bumbling Keiko. Rina must have enjoyed her work with Noburo as she has signed to another film for him ,which will arrive 2014. You heard of Food on the Brain ,this is more Food in your Brain, up your nose ,in your chest, and about every where else.